1. Im-El, an ancestor of Kal-El discovers a comet is heading to Krypton and launches a missile to destroy it before it can harm the planet. The missile works shattering the comet into pieces, deflecting their course... onto a flight path to Earth. 50,000 years later a piece of the comet crash lands in prehistory France where the Savage clan of hunters is battling their opposing clans. When Vandal's father spots the 'piece of the sun' he and his son head to find it, but when they do Vandal is drawn to it and its gift of 'bones like fire and skin like rock' he promptly kills his father and all the clan members that refuse his leadership. 2. Vandal now immortal but with a hunger for power and to build a powerful clan is drawn to 121 AD China and the Han clan. Hoping this revered clan could teach him, he is more than disappointed that they perform far below their rumored level of power. Despite the disappointment, Vandal befriends an astronomer in the Clan, Zhang Heng and confides in him the secret of his power. Months later, Heng leads his friend to a secluded cliff top so that Vandal could witness another shard of the meteor soaring in the sky. He reveals to Vandal that the meteor has many fragments that are all heading towards Earth over an extended period of time that will last hundreds of years. Savage realizes the meteor can give him even more power but Heng refuses to help him to gather more power than he already has. The greedy and angry Vandal promptly murders Zheng for his judgements. 3. Now it is 1543 AD, Rome. Vandal admires the art of Michelangelo's Sistine Chapel and its depictions of power. He has again befriended a brilliant intellectual, similar to Heng but is perturbed when he visits Father Nicolaus and discovers that despite instructions to create a device to amplify the energy of the meteor fragments he has been instead writing a book, this betrayal, as before leads to death. 4. Germany 1941, Vandal is now working with Captain Nazi. The two are piloting a rocket to intercept a piece of the meteor. Nazi believes in a promise from Savage that they will share the meteor power once they find it. They find it as expected however their craft begins to fall apart leading to Captain Nazi wanting to abort the mission. Vandal is enraged and instructs Nazi to throw him out of their rocket and directly into the meteor. Captain Nazi refuses and crashes the rocket back on Earth betrayed again Vandal beats Captain Nazi to death. 1. Clark discovers a plot by a robot to steal some new technology and attempts to stop the robbery and the robot but his nose is firmly out of joint when The Flash intervenes and saves the day instead. Later visiting John Henry Irons he admits that being powerless has left him scared of what will happen. He admits every attempt to power up has led to failure. John admits that Flash confided in him about Clark's power-up or suicide bid to the sun recently. Lana appears and tells John to show Clark his research. A desperate Clark is willing to try anything despite John admitting the unstable nature of his theory could kill Clark. 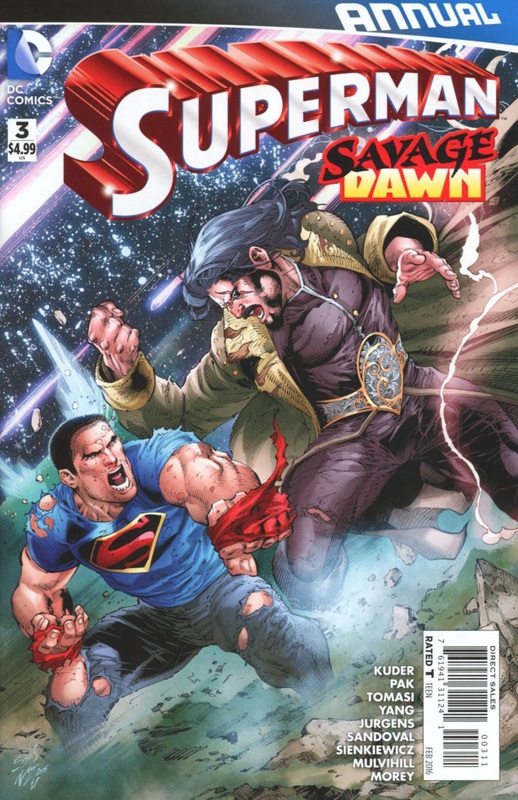 Lana advises Clark that he should rethink being Superman and find a new calling but Clark turns to John and tells him to continue his research, Superman will return. 2. Clark visits the Daily Planet and watches from a window ledge as Perry lectures his former colleagues to go out and get some stories, to make the paper regains its credibility after its links to Superman threw its reputation into the air. Lois instinctively realizes she is being watched and whispers her friends name. Clark walks away and is caught out by an audio alert from Lex Luthor for the League's finest to come to his aid. Teleporting to the tower his friends greet him and try to let him fit in but Lex brushes him off and leads the team off on a mission. Diana tries to reach out to him but instead leaves Clark feeling very alone. He tries to assist the team from the JL satellite only to discover Lex has literally cut him out of the League. Suddenly the satellite bypasses the lock as Superman is the only person on the satellite and it has detected danger. 3. Superman appears as a Lexoil tanker is about to fall off a bridge. Clark and several civilians are able to pull it far enough away from the bridge barriers to stop it falling and for a moment Clark enjoys an appearance as Superman that is almost akin to what he is used to. Clark watches as the JL Watchtower appears in the sky and begins to descend. As it comes dangerously close he watches as the Stormwatch Carrier causes the Watchtower to explode, Clark survives the atmospheric blast but all the innocents nearby are killed. Somehow Clark realizes the destruction of the Watchtower has been caused by Vandal Savage, Wrath, Frankenstein's Monster and Hordr_Root. With the Watchtower destroyed, the Justice League too far away on a mission in deep space with Lex, countless civilians dead, Clark swears to do whatever it takes to stop them all. To Be Continued in Action Comics #48. Story - 2: This was a Superman Annual right? I get that Vandal Savage and his disturbed and mistreated offspring are the big bads in 'Truth' but I don't care about the backstory of any of them. What I really wanted was a solid Superman story. What I got was a teaser to the next chapter and I paid US$4.99 for what amounts to two pages. If I'm going to honest, this read into Vandal's origins is an interesting take on him and his link to Krypton (however vague), but again all this is, is more filler when all I want is story progression. Dispersing the chapters and jumping between Clark's story and Vandal's past only add to a confusing and profusely irritating Annual. Would I advise you to buy it? No. It really is worthy only of a wikipedia update to Vandal Savage's entry. Clark's story offers a glimmer of hope in John Henry Iron's research (though we can't see what it is) and a very touching moment where Lana tries to convince Clark to use his gifts in other ways to help rather than as Superman. Lois has a short scene that is equally as touching though regretfully still not offering the resolution both Lois & Clark need. The emphasis though seems to be wrong. Both Vandal and Clark are in a desperate hunger for power. Vandal I don't care about but I share Lana's thoughts and even Diana's, Superman isn't about power. The decision to write Clark as desperate to be a big gun again is unfortunately what undoes this entire Annual and totally misses the point of what makes Clark the man he is deep down. Art - 1: No. Just no. The jumping around in art is even more horrible than the storylining narrative. It is the equivalent of sitting next to someone who has a TV remote and a finger tapping the channel changer back and forth while you are powerless to do anything. Cover Art - 3: A very 1990s style cover. Lots of open mouth and exposed teeth and gums, awkward anatomy... but despite all of this it's a strangely eye-catching and enamoring cover.